We compared dozens of digital kitchen scales to find the best and most popular models. We looked at three key points to determine how good each scale was: price, customer satisfaction, and accuracy. There were plenty of other factors contributing to our ratings, but those three carried the most weight. We ended up with eleven kitchen scales that we confidently rank as the best kitchen scales. 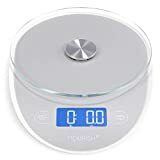 The Great Goods digital kitchen scale is a flat, silver platform that also displays the nutritional facts of the food that you're weighing. It has a database of over 2,000 meals, or you can use a smartphone app (available on Android and iPhone) to enter in custom foods. Customers love how easy it is to clean the scale, as messes just wipe right off it with a paper towel. The nutritional display is also a nifty feature that attracted a lot of people on special diets. The auto-off feature annoyed some users because it only stays powered on for a minute, which isn't long enough for some people to add their food. It also had varying levels of accuracy depending on how fresh the batteries were. Without the novelty value of the nutritional display and app, Great Goods would be an average scale, so we rated it 4 out of 5 stars. 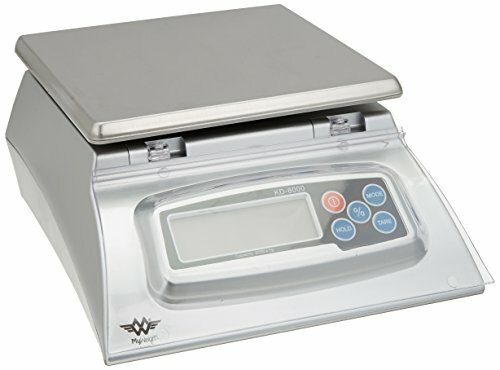 American Weigh’s LB-501 model digital kitchen scale is a traditional bowl scale with an LCD display. It has a 500-gram capacity and comes with two calibration weights, as well as four AA batteries. The American Weigh scale is popular with customers who make their own e-cigarette juice. The detachable bowl is convenient for liquids and powders, and it’s dishwasher safe. The capacity is significantly smaller than other scales on our list, which means you can’t use it for heavier objects like meat or vegetables over one pound. It’s also a little more expensive than you’d expect for this type of scale. 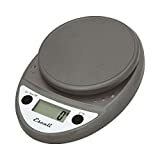 This little American Weigh scale is great for small measurements, but can’t handle anything heavier than 500 grams, so we give it 4.1 out of 5 stars. 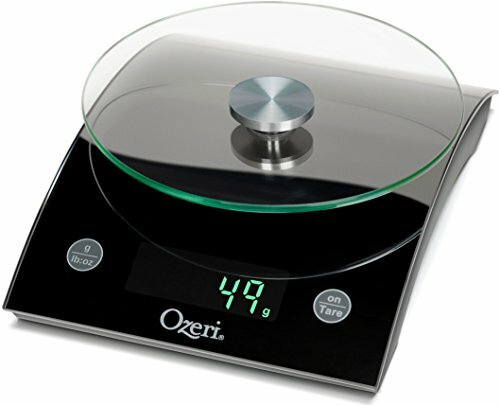 Ozeri’s Epicurean scale has a contoured black base with a removable glass weighing platform. It can weigh up to 18 pounds, in units as small as one gram. The LED display is a bright green that contrasts well with the black background. Customers were pleased by how easy it is to clean the removable glass platform, as well as the base with its capacitive buttons. The large capacity means you can weigh almost any food you can think of. The scale is also straightforward to use, as there are only two buttons and two modes (imperial and metric). The scale is a little slow to stabilize and give a final weight, and the bright LED display means the batteries run out relatively quickly. It’s also larger than a lot of similar kitchen scales. The Epicurean scale is attractive and has a large capacity, but it’s also slow and goes through batteries faster than it should, so we feel it’s worth 4.2 out of 5 stars. 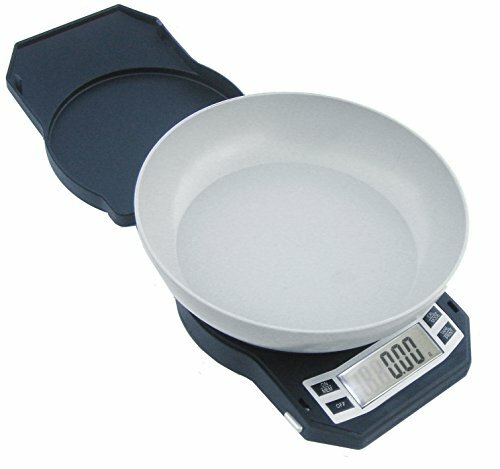 The EatSmart Precision Pro is a white kitchen scale with a round platform that can weigh up to 11 pounds. It has four modes: ounces, pounds, grams, and kilograms. It comes with a free EatSmart calorie factors guide for easy portion control and dieting. 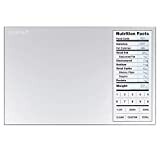 Customers love how sleek and attractive the EatSmart scale is, and the included guide made counting calories a lot easier. The scale is also extremely accurate, and the broad platform is convenient if you're weighing larger items. Some users received defective units that wouldn't tare correctly, or displayed an error message right out of the box. EatSmart support replied to these reviews and offered exchanges or refunds. Amazon also deleted thousands of positive reviews, which makes us wonder how honest the EatSmart company is. The EatSmart Precision Pro scale is good looking and appears to be accurate, but Amazon had to delete more than half of their positive reviews for violating the ToS, which means we can’t be sure the remaining reviews are genuine. We give it 4.3 out of 5 stars. 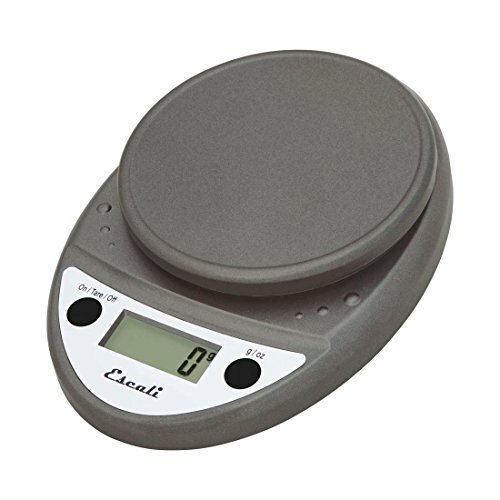 The Escali Primo digital kitchen scale comes in nine different colors and can weigh up to 11 pounds at a time. It can display weights in units of ounces, pounds, or grams on the LCD screen. The reviews for this scale were overwhelmingly positive, and we didn’t find any evidence of fake accounts or deleted reviews. Customers were impressed by how accurate the Escali Primo scale is, and how easy it is to clean. There is one annoying quirk that Escali apparently didn't cover in the manual; after you tare the scale to zero, you have to wait a minute or so before adding food. Otherwise, the scale will zero out again even with the extra weight. The Escali Primo scale would be great if it weren’t for the tare issue, so we rated it 4.4 out of 5 stars. 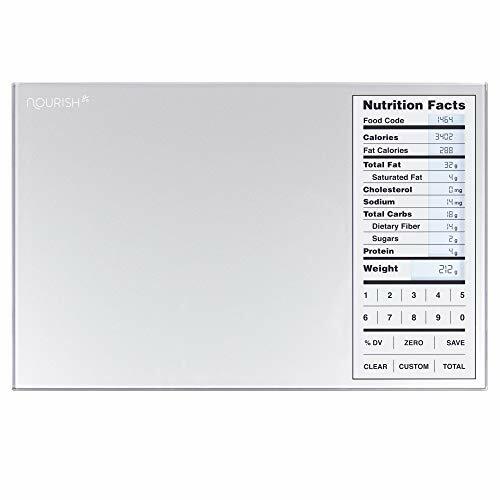 The Nourish digital scale uses a backlit LCD screen and a large glass weighing platform with a maximum capacity of 11 pounds. It can display weight in pounds, ounces, fluid ounces, and milliliters. 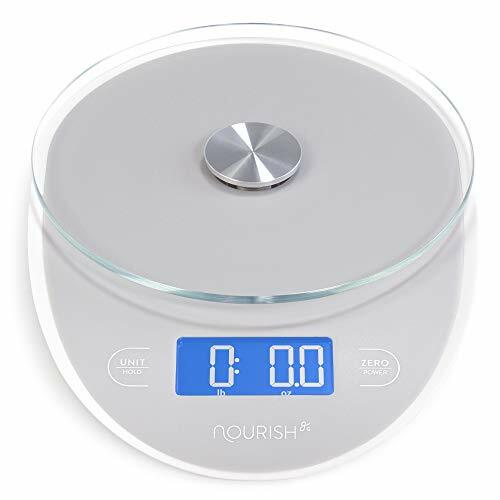 Like other digital scales, the Nourish scale has an auto-off feature that shuts it down after two minutes; however, there’s also a “hold” function that will delay the auto-off for five minutes. Customers were thrilled with that feature. They also reported that the scale is easy to clean, and it came with three AAA batteries. Many customers complained that the minimum weight of .5 grams wasn’t low enough for some baking projects and coffee weighing. You also have to add weight to it slowly. Otherwise, there's a delay, and the weight jumps around. The Nourish digital scale is accurate but slow, so it earned 4.5 out of 5 stars. 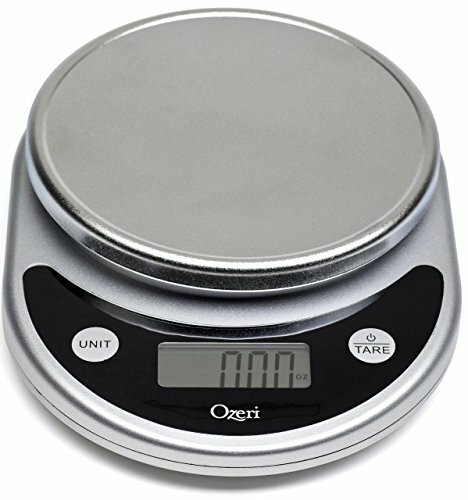 The second Ozeri scale on our list is smaller and less expensive than the Epicurean model. It comes in seven different color options, and the metal platform can weigh up to 11.24 pounds in increments of one gram. Weight can be displayed in units of grams, pounds, pounds: ounces, ounces, and milliliters. A few customers tested the accuracy of the scale using a variety of methods and found that it's significantly more accurate than other scales at this price point. It's small and light enough that you can keep it pretty much anywhere in your kitchen, though it looks great sitting out on the counter. It's also easy to clean with a paper towel or disinfecting wipe. The positioning of the display relative to the weighing platform means that larger food items or dishes will block you from reading it. Some customers also noted that the tare function could be a little finicky right after turning the scale on. The lightweight Ozeri Pronto is a cute little scale, but it’s also slow to wake up, so we give it 4.6 out of 5 stars. 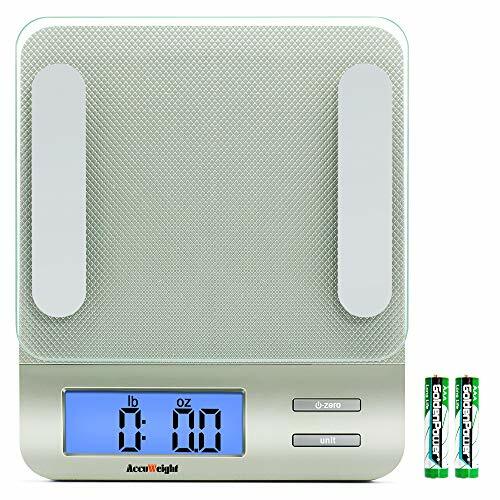 My Weigh's LCD kitchen scale is an old-fashioned-looking square model that can weigh up to 17.6 pounds at a time. The back-lit display can be configured to use pounds, pounds: ounces, ounces, and kilograms. The weighing platform is stainless steel, and a removable plastic cover protects the screen and buttons from food splatter. Customers found this scale to be extremely durable even after years of abuse. The stainless steel weighing platform is also very easy to clean, and the splatter shield keeps the display from wearing down due to messes or repeated cleanings. The My Weigh scale is pre-calibrated in the factory, but the manual suggests calibrating it yourself with a 5-kilogram weight, which isn't included. It's also a remarkably expensive scale, considering how old-fashioned it is. 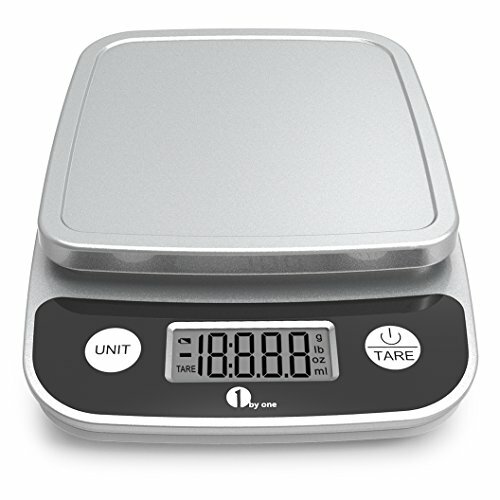 The My Weigh KD8000 kitchen scale is durable and high-capacity, but it’s also expensive and needs additional calibration. It earned 4.7 out of 5 stars. 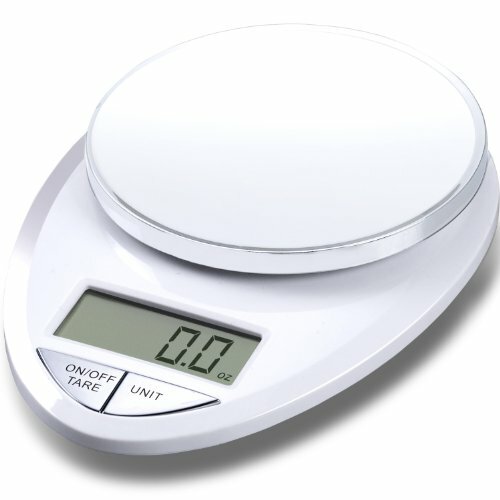 The 1byone digital kitchen scale is a silver and black plastic model with a simple LCD screen. The platform can weigh items ranging from one gram to 11 pounds, displayed in units of pounds, ounces, grams, or milliliters. Customers reported that this scale is easy to use and doesn’t drain the batteries as quickly as some other models. It’s lightweight and easy to store when it’s not in use. One of the main complaints was how flimsy or "cheap" the scale feels. Despite the metallic color, both the base and the platform are plastic. The no-frills 1byone digital kitchen scale is easy and inexpensive, though cheaply made, so we rated it 4.8 out of 5 stars. 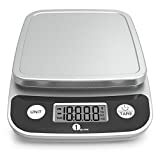 The AmazonBasics digital kitchen scale has a stainless steel weighing platform with a capacity of 11 pounds. The widescreen LCD screen can display weights in units of ounces, grams, and pounds. The scale is very low-profile, measuring only 1.6 inches tall. 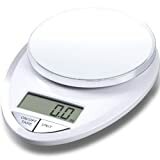 Reviewers were impressed by the reliability and accuracy of this inexpensive scale. The stainless steel is durable and easy to clean, and the weight display is highly visible even if you have vision problems. The big downside of the AmazonBasics scale is that the auto-shutoff can’t be disabled, and kicks in after two minutes. If you need to be able to gradually add weight to the scale, for example, using pour-over coffee, you run the risk of the scale shutting down in the middle and erasing the previous tare. AmazonBasics’ digital kitchen scale is robust and accurate, though its auto-shutoff feature can be annoying. We think it deserves 4.8 out of 5 stars. 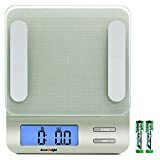 The AccuWeight multifunction food and kitchen scale has four high-precision sensors to ensure accurate weight measurements. The tempered glass platform can weigh up to 11 pounds at once, and it's easy to disinfect so that you can place raw food on it directly. The large, blue back-lit LCD screen can display weight in units of pounds, ounces, grams, milliliters, and fluid ounces. Customers love how fast and accurate the scale is. The functions are easy to use, and the auto-off feature can be enabled or disabled using a switch on the underside of the base. When reviewers tested to see if the position of the item on the platform changed the weight readings, they found that the display showed the accurate weight every time. The only negative aspect of the scale that we could find is that the screen dims (but doesn’t turn off) after just a few seconds as a battery-saving measure. The AccuWeight digital food and kitchen scale is an affordable workhorse that will give you precise measurements every time you use it. If it weren't for the screen dimming "feature," we would give it a perfect score, but it still ranks as our highest-rated digital kitchen scale with 4.9 out of 5 stars. 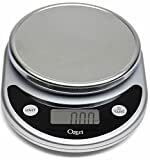 All of the digital kitchen scales we reviewed here are available on Amazon Prime for under $$. Any of them will make an excellent choice if you're looking for something easy and inexpensive. We hope our reviews of the top eleven best kitchen scales helps you find the perfect one for you and your family.